The extra-virgin olive oil Sant’Andrea is produced in limited quantities, using the traditional hand harvesting and cold pressing systems. These features give our oil a durable delicate taste. 4. 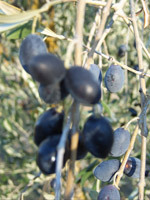 The harvested olives are gathered in aerated plastic boxes and are pressed within 12 hours from harvesting. Pressing is made by a continuous process oil mill which ensures proper hygienic conditions, permits temperature check during all phases of pressing, thus maintaining intact natural substances of fresh olives and giving our oil palatable aromatic tones, and a harmonious and round taste with the right bitter and spicy note.. The mill is equipped with granite grinders permitting a soft grinding and produces a homogeneous and cold paste; thus, natural elements of fresh olives are preserved and oil takes palatable aromatic tones, a harmonious and round taste, with the right bitter and spicy note. In order to preserve its high quality, Sant’Andrea oil is stored in a cold and dry place, at uniform temperature, in steel storage bins. When pomaces are decanted, we divide it from oil, without any filtering process, in order to preserve the natural features of our biological product. Such an important olive oil needs a proper packaging: we conceived the “Magnum d’Olio Biologico Sant’Andrea”. Magnum Sant’Andrea biological oil bottle is the ideal gift for your friends or customers. An original idea for a gift, synthesising prestige, quality and tradition. An extra-virgin olive oil from biological agriculture, produced in Sicily and known even in Japan. Order now! An operator will soon contact you to arrange with you the terms of delivery and help you to choose the better package for the receiver of your cult gift.